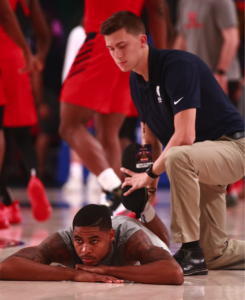 Though Anthony Richardson has spent his entire undergraduate career at UIndy, it wasn’t until he changed his major to athletic training that UIndy became “home” to him. He will graduate in May 2019 with a bachelor’s degree in athletic training and head toward his new home – Campbell University in North Carolina, where he has accepted a graduate assistant athletic training position and will pursue a masters degree in education with a focus in kinesiology. Richardson said leaving UIndy won’t be easy. During his undergraduate education, Richardson participated in the Athletic Training Student Association (ATSA) and in intramural sports. Playing intramurals allowed him to make friends and connections with people he would not have encountered within his major. “I was able to expand my network by meeting people who have a desire to work in different positions in athletics,” said the Greenwood, Indiana native. Richardson said UIndy’s athletic training faculty and an extensive list of clinical training sites have set him up for success. His training sites included Indy Eleven, Indy Fuel, Butler University, Marian University, Lawrence Central High School, and Lawrence North High School.